I needed something quick and easy today, as I was rushing to catch a train to the beach with my friend. 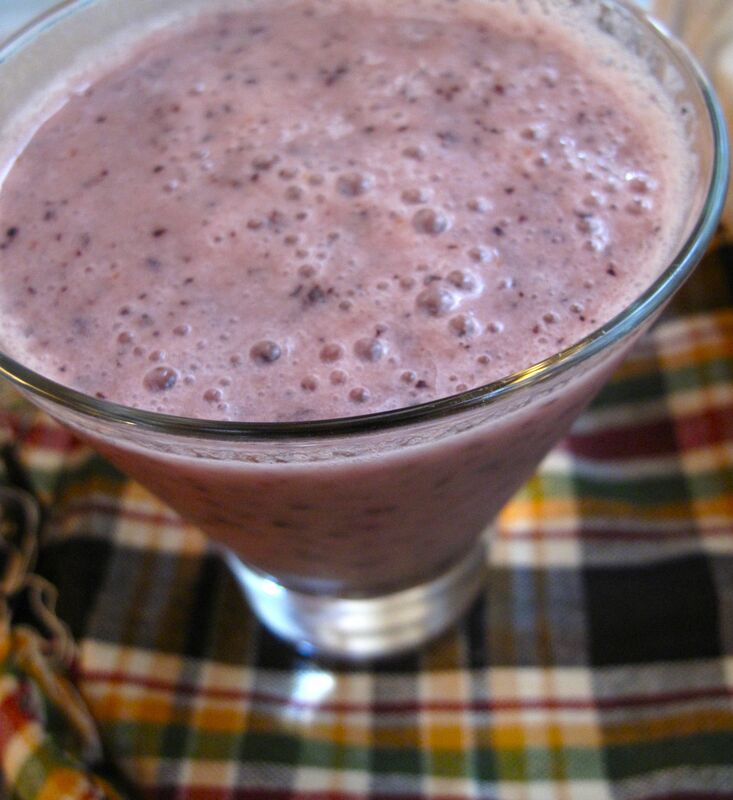 I threw a banana, blueberries, and some almond milk with ice in a blender, and voila! Vegan smoothie. I’ve been wanting to recreate one of my favorite smoothies from a shop down the street – banana, almond milk, and spirulina, but I’ve been to three stores and can’t find spirulina powder anywhere. I’ll have to visit the health food store back in my old neighborhood, which has everything! I wanted to throw together something simple, cool, and refreshing for the beach today. And every time I opened my fridge, that last chunk of farmer’s market sourdough (already used in Monday’s portobello sandwich and yesterday’s french toast) stared me in the face. It’s fairly stale by now, but I hate wasting things so I found a way to use it. 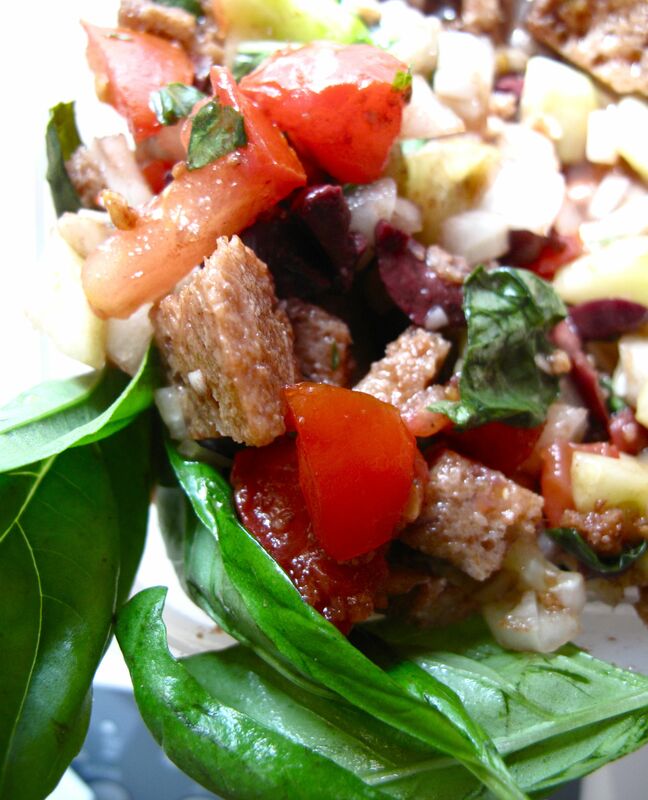 Panzanella salad is popular in the summer in Florence and other parts of central Italy. It includes chunks of soaked stale bread and tomatoes, sometimes onions and basil, dressed with olive oil and vinegar. I’d seen a few recipes online, but I decided to just go with what was in my fridge. I chopped up the last of the bread into bite size pieces, and added chopped cucumber, sweet vidalia onion, vine tomatoes, a few kalamata olives, and a large handful of fresh basil. 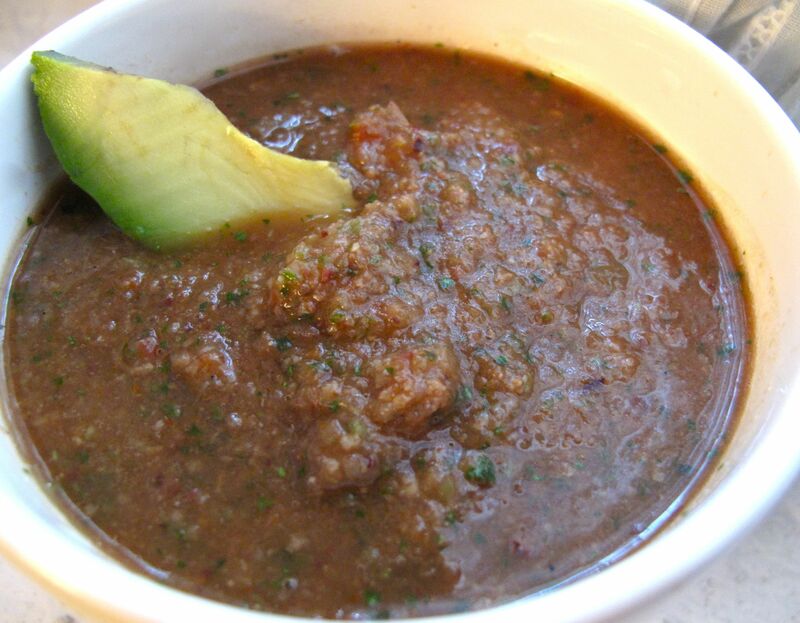 I dressed it with olive oil, a mixture of balsamic and red wine vinegar, minced garlic, and salt and pepper. My friend and I ate it at the beach with a pile of fresh mango, cherries, and grapes. Tastewise, the panzanella was good, but I think I should have toasted the bread first – it needed a little less stale and a little more crunch. Dinner was lunch… in a blender. Ok, let me explain. I was saying earlier that all this cooking has been fun, but I have so many leftovers. My friend Molly (who is an amazing professional chef) suggested that I throw the panzanella salad into a food processor and add a few ingredients to make it gazpacho. So that’s exactly what I did. It occurred to me that it would be sort of an Italian flavored gazpacho, given the bread and basil, but I made it work. I dumped all the leftover panzanella in the Cuisinart and added one more tomato, some tomato juice, a scallion, two large handfuls of cilantro, two jalapenos I found in the bottom veggie drawer, a dash of cumin and worcestershire sauce, and the juice from half a lime. I ate my gazpacho with a nice slice of avocado and some of last night’s leftover soba noodles and summer rolls. Hey, while I’m mixing Italian and Spanish in one soup, I might as well throw in Asian on the side! This entry was posted in Cooking adventures, Vegan and tagged salad, soup, vegan, vegetarian. Bookmark the permalink.